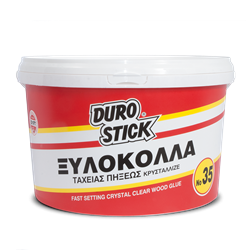 High strength carpentry glue with extreme durability, made from pure, flexible PVA. Due to its flexibility, it protects all applications from vibrations, impacts, temperatures, and even from the deformation of the wood. Suitable for soft and hard woods. Suitable for MDF, veneer, chipboard, plywood, Formica, hardboard, cardboard, polystyrene, cork and plaster board. It applies white and becomes crystal clear when dry. Clasiffied D1FT per EN 12004. 500gr, 1kg, 5kg, 25kg, 50kg.